This watch is very heavy and realistic. Crystals sparkle like diamonds would. My only complaint is that you can't have it sized. Way to big. 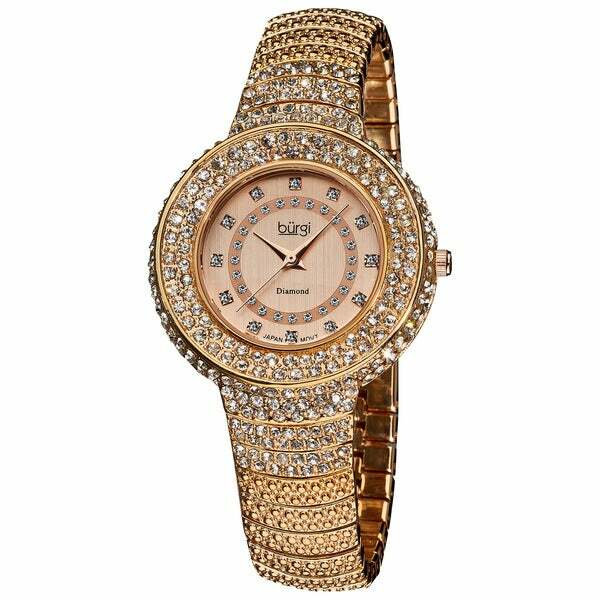 Let your wrist sparkle with the 12 diamond hour markers and three rows of crystals on this Burgi women's fashion watch. With a rosetone dial and hands, the center stands out while still complementing the surrounding gold color. The textured metal on the watch band accents the rugged center crystals of the bezel. Adjust the time without hassle using the push/pull crown. The water resistance feature allows for use on rainy days. Wear this watch for many years, as it is built with stainless steel material that resists damage. The bracelet features a clasp for simple attachment. All measurements are approximate and may vary slightly from thelisted dimensions. Women's watch bands can be sized to fit 6.5-inch to 7.5-inchwrists. Lots of glitz stunning watch. Needs to be sized. Attempted to size myself after reviewing video but is difficult so will take to jeweler. After wearing it I find the clasp is extremely hard to open once it’s locked in place. Don’t know if others have also experienced this. Gorgeous watch! Looks much more expensive than the purchase price. I only use the watch for special occasions but it has held up well. I have received lots of compliments on this watch. I'd highly recommend it. I was just looking at watches with no intentions of a purchase. This watch caught my eye. So pretty. Heavy and beautiful rose tone. Lost one stone within the month. A bit disappointed but still wear it almost daily. I got this watch as a wedding present for my wife, and was very pleased with the appearance of it. It looks nice and not cheap. It does come rather large, so expect to have to bring it in to be sized to her wrist size. I have worn this watch to several weddings and showers. Many commented on how nice it was. I told them that I had purchased it from the O.com and I have purchased several others and very pleased with quality. Gorgeous! I get tons of compliments on this one. It looks soooooo expensive and feels great on my arm. Beautiful but had to return. Couldn't figure out the clasp and customer service was no help. "Can't get clasp to work. How does it close?" It is released by lifting the clasp and unsnapping it from the latch bar. In this case the clasp is the one that has Burgi engraved on it. "i have a very small wrist, is the band adjustable?" Hello Marylu, no, it is not. Thank you for shopping with us!